Not only did Warhol openly acknowledge that he loved money (having come from a poor family in industrial Pittsburgh), but he loved drawing and painting it as well. 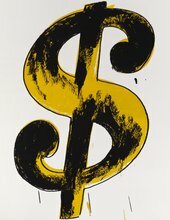 In the early 1960s he depicted one-dollar bills and then in 1981 he returned to the imagery and completed a whole series of drawings and paintings of the dollar sign. This is one of the largest of these paintings. The image is screenprinted on to the stark white canvas, but it is based on a marker pen and ink drawing that Warhol himself had made. Even the splatters of the ink have been retained.